kubiwa (encircle the neck) - in which Kata? What Kata do we find this in? Says Passai, Kushanku but not sure where in the Kata? (Possibly not a great link to post up, under the circumstances Paul). Updated to show a different source. What part of Sandan then? I can see that in Bassai Dai. The transistion between the last Yama-Zuki and the following turn with the following Sukui-Uke looks like Kubiwa to me. Maybe that is a better source, than the one you provided. Some people could possibly be offended, because of the circumstances, when I understand Lees remark correctly. ... Maybe that is a better source, than the one you provided. Some people could possibly be offended, because of the circumstances, when I understand Lees remark correctly. Removed reference so hopefully no offence etc. The 'over the opposite shoulder hooking punch techniques' at the very end of the kata. 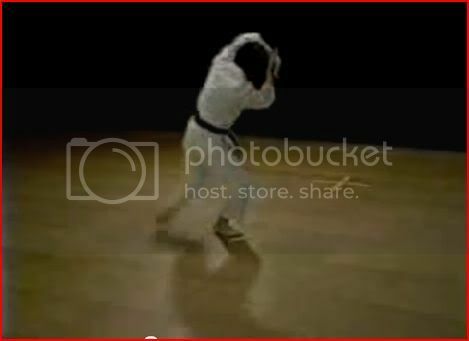 The technique can also be seen in various Taekwondo Poomsae (not suprising given Taekwondo`s Karate roots). The clearest example I can think of is in Poomsae Jitae (the 6th black belt pattern). You step forwards doing a middle section punch, using what you would call Hikite to unbalance and drag your oponent into the punch. You then grab his head, turning 270 degrees into back stance low section double knife hand block. Today when doing the block the non blocking hand is placed in front of the solar plexus obscuring this application somewhat, but in the early 70s you would do this with both hands lower (like holding a head). In it's simplist form I see this movement representative of Naihanchi Kata - the elbow and the stack on hips for neck wrench. The 3rd move of Heian/Pinan Godan. Move 1: Ude Uke, Move 2: Gyaku Zuki, Move 3: Kage Zuki. So your pulling hand (right) is twisting the head towards the hip, as the punching hand (left) snaps the neck. The neck crank shown in the link is not “Kubi-Wa” as Gichin Funakoshi describes it. “Kubi-Wa” means “to encircle the neck”, not to twist it. I also notice that most of the descriptions above are looking at neck cranks. So we may be talking at crossed purposes? Do we mean in what kata does Kubi-Wa appear? Or in what kata do neck cranks appear? They are not the same thing in my view. The technique of Kubi-Wa is when we put the arm around the neck (biceps on one side and forearm on the other). The leg is behind the enemy’s leg and we twist to take them over. It’s a throw / balance break and the neck is not cranked. The picture is of me setting up the throw, and to complete it I would turn towards the camera. If you look at Karate-Do Kyohan (any edtion, not just the original with photos of Funakoshi himself doing the throw) you can see that this is what he calls Kubi-Wa. It’s not cranking the neck, but encircling it (as the name suggests) to topple the enemy over. As regards which kata this method is found in, the most obvious example would be Kanku-Dai / Kushanku. The enemy’s arm is pushed to one side as your arm comes over the top and slams against the enemy’s chest as your leg is placed behind theirs (the nukite with the arm across the chest). Now that the balance is broken the arm across the chest encircles the neck and you twist to take them over. They can’t step to regain balance because your leg is in the way (this being the twist flowing into the “lower-block” in horse stance). If this is a little hard to follow, don’t worry as I’m going to film a set of karate throws for this site soon (as suggested by the people on Facebook) and I’ll make this one of the first ones I do. I hope that helps and clears up any confusion on what Kubi-Wa is? Thanks for that iain, nice descripton - I was as always 'far to general' LOL. I look forward to the video presentations of throws from kata. Kubiwa is admittedly a slightly unorthadox name for the technique and I havent really seen it used outside of Funakoshi's work (he uses his own terms for most of the throws actually). 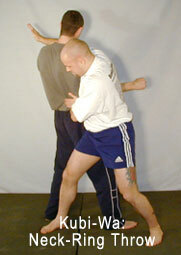 The technique is more commonly known in Japanese martial arts circles as "kubi nage" meaning "neck throw" as in "throw the opponent while securing his neck". Thanks Iain ! You mean the nukite in step 54 onwards here: http://www.hackbridgedojo.co.uk/KANKU_DAI.jpg ? I had linked back to Funakoshi doing it however it was in a article by HC. I meant Kubiwa as you described it, and was asking which Kata it appears in. Would you say the 2 final techniques in Sandan represent this? If not what are these techniques? You’re welcome! Yes, that’s the motion I was referring to. I would see those techniques as being hip throws and not Kubi-Wa. The legs are not in the right position for Kubi-Wa as Funakoshi demonstrates it (i.e. in a kind of front stance). I personally feel the motion better reflects an Oi-Goshi or Uke-Goshi style throw. However, I can totally see how the motion could be getting behind the enemy and “encircling the neck”, but the body / leg position is not right for the “encircling the neck throw” so I personally would not label it as Kubi-Wa, but I can see why others may decide to. I always thought this movement was an escape from someone trying to hold your arm up behind your back in a shoulder lock (not sure if the is correct descrtipion) and the movement is you rolling out of the lock into the person and striking. Just read a comment on your facebook page about this thread, so there is technique there for avoiding wrist grab and the final twist to face the opposite direction is the Kubiwa ...? It would therefore following that steps 8-9 here in Heian Sandan http://www.brevardshotokan.com/static/images/kata/heian-sandan.png Represent the same technique? I don’t see it that way. 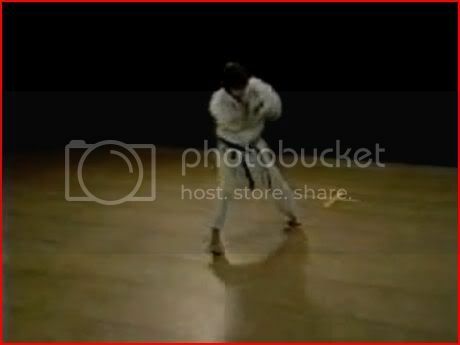 The motions are different in the version of the kata I do: the hand is on the hip, not across the chest, and the lead leg is straight on the turn; where there is also a forward lean. I see that motion as a winding throw that is set up by an attack to the elbow joint & chest slam. Hard to explain, but it’s “Sandan 1” for anyone who has seen volume one of the “Pinan Heian Series: The Complete Fighting System” DVDs. As I say, the version of the kata I do would not have Kubi-Wa fit there. Kubiwa is admittedly a slightly unorthadox name for the technique and I haven’t really seen it used outside of Funakoshi's work (he uses his own terms for most of the throws actually). That’s very true and I often wonder about that. Why call a technique “to topple a folding screen” when almost everyone else calls it an “outer reaping throw”? My guess, and I would appreciate other thoughts, is that Funakoshi was signalling karate’s “uniqueness” i.e. using “judo terminology” could be misconstrued. I find myself using a mix of the “common terminology” and Funakoshi’s for the throws and that does get confusing at times i.e. Funakoshi’s “shoulder wheel” is not the common shoulder-wheel; same with the “valley drop”. If you refer to the throw Funakoshi labelled "Katawa Guruma", then I have to correct the translation. The kanji Funakoshi has used for writing "Katawa" can only be translated as "cripple" therefore "Katawa Guruma" is the "Cripple Wheel". The Judo throw is called "Kata Guruma" and is written with the Kanji for "shoulder". So I can see no reason for confusion, at least in this case. Tani Otoshi changes even in Funakoshis writings. The throw he refered to as Tani Otoshi (valley drop) in his first two publications is called Saka Zuchi in Karate Do Kyohan (KDK). The Tani Otoshi in KDK is a brand new throw. That leads to confusion, in my mind. Interesting! The Neptune publications version of Kyohan has the throw translated as "Shoulder Wheel" (which is what I was going with). The Kyodansha version of Kyohan has the throw translated as "Half Wheel". Are we saying both of these translations are wrong? If so, it's remarkable no one has picked up on the before. Putting kanji to one side, Shoulder Wheel seems like a good description of the throw as the shoulder is gripped and there is a wheeling motion. Half Wheel also sounds OK, because uke is wheeled lower that they could be on the over the shoulder version. Not sure what Funakoshi could be referring to with "Cripple Wheel"? The throw is pretty tame and unlikely to lead to any serious injury. That kanji definitely has no alternative reading? Thanks for sharing this Holger. Interesting stuff! The two kanji (read as katawa) together mean deformity or disfigurement. The first kanji alone means one sided. The second one alone means ring, wheel or circle. Hence the (IMHO bad) half wheel translation. But when you put everything together the translation you would get is half wheel wheel. The half wheel is rather a metaphor for a disability. Half wheels are not rolling, if you know what I mean. In his 1922 book Funakoshis name for that throw was Bikko Daoshi - to throw a lame. So I go definitly with the cripple wheel. Why he used those unusual names? Maybe he was old school and liked such pictures as it was often the case with the chinese description of techniques like in the Bubishi. Who knows. Hmm. It is possible that the name was originally just a metaphorical description of the motion along the lines of "single wheel revolution" and unfortunately the term katawa evolved to become a synonym for disability, making it no longer suitable for public consumption. Language change certianly works along those lines with acquired negative meanings and conotations overshadowing and displacing earlier neutral ones. It is of course just as plausible that the name was a colloquial and vastly politically incorrect one from the start and was later sanitised for public presentation. I guess some serious linguistic research into the origins and adoption of the word would be the only way to find out! Dosen't change the fact that the name katawa guruma in its original form would not be allowed on Japanese tv or in print these days. It is a seriously offensive word! As to the original post, I see the 'head crank' throw in just about any kata where the hands are returned to the sides in a so-called 'neutral' position (i.e. any Naihanchi, as an example): Grasp the chin and back of the head, (or pony tail as shown in the buibishi illustration on the original link's page), then pivot on the near foot and twist. I would emphasize, having had an experience just two days ago where a student had a major 'pop' and left class with a stiff neck that this throw should be undertaken with an extreme degree of caution. In the case I am referencing, having observed the whole thing, the 'thrower' in my opinion dd not use undue force or pressure, but because the throw was being done 'from movement' there was an added stress placed on the uke's neck. My advice is to go especially slow with this one. As to an 'encricling' version of the throw and the literal translation of "kubi wa", personally, while i have nothing to refute it, I am not sure that the author is not taking some perhaps unintentional liberties there with that descroiption for the illustrated technique. To me, 'encircling' the neck that brings to mind what I would call more of a 'headlock throw' or 'head and arm throw' in English. (I am sure there is a Japanese name, I just don't know it.) Basically, this is your run of the mill 'headlock throw' (the varierty which would be illegal in Greco-Roman wrestling), so in freestlye wrestling (as I have expereinced the terms), the shoulder is added to the throw, making it a (theoretically safer) and therefore legal move. The head is wrapped with the arm to grip the tricep, the other hand grasps the tricep tendon in a 'closed' grip, and the back is slightly quartered to the opponent. In our school, based on a belief that many of the same judo 'mechanics' use variable 'handles' we practice a tai-otoshi 'version', an O-goshi 'version', and a sutemi waza 'version' using this grip. Theoreticaly, you could also classify a basic aikido--type 'clothesline'' version (i.e. Iain's video illustration) and a modified osoto-gari version (i.e. Iain's still illustartion, above), and even an over-the back neck-break version using this 'grip' depending on your foot position and relative body placement compared to the opponent. So, the throw I learned as Kubi-nage much more resembles the mechanics appearing in the opening turn of Pinan Shodan than the throws I have been describing. The explanation I received from my instructor was that in old school jujutsu, this was not an 'underhook', but a sharp rap with the knuckles to the opponent's occipetal lobe. Because of the ultimate 'relative infinity' of personal variation and personal preference between grips and throws, consistent classification therefore becomes difficult unless you are studying within the boundareis of a continaerized art using 'their' terms and labels for what things 'are'... at least within that system. Doesn’t change the fact that the name katawa guruma in its original form would not be allowed on Japanese tv or in print these days. It is a seriously offensive word! Fascinating stuff! Seeing as the name for the throw would be offensive to modern ears and eyes, could that explain why it has been widely translated as “half wheel” and “shoulder wheel”? I’m thinking along the lines of how the ‘a’ has been replaced with an ‘o’ in the western writing of the Russian art of ‘Sombo’ to avoid using the original Russian word which is also a racist term in the west. The name is an acronym if “Samooborona Bez Oruzhiya” (self-defence without weapons), so ‘Sombo’ is incorrect; but it’s politically correct making it the preferred term. Could it be the same here in that, although not a literally correct modern translation, the terms “Shoulder Wheel” and “Half Wheel” are the “official translations” due to the way in which language is used today? Does anyone here know what kanji is used for the throw in modern editions of Karate-Do Kyohan in Japan? Have they stuck with “katawa” or has that been replaced with something like “kata”? Unfortunately, I don't. But what was the source for the translation of the neptunes publication? What is offensive in Japan is not necessarily offensive in other cultures. So I think the translation is flawed. I don't have the book in my shelf, but on the neptunes website I have found the translation of the Ken(po) no Taiyo Hakku. The 8 main verses of the fist. The neptune translation is: "The eight phrases for the secret of the fist". My problem with that is, that none of the kanji used in Ken(po) no Taiyo Hakku has the meaning of secret. Where does that come from??? IMHO that is a flawed translation. Maybe I am a bit to rigid in terms of correct translations, but why putting the "mystifying" secret in it? Sorry for being a little offtopic. Unfortunately I am no longer in posession of a Japanese copy of kyohan and wont be in Japan and able to check until September. I do recall that it was the kanji for "shoulder" that was used instead of "single" (both are read as kata so the pronnunciation of the word would stay the same as katawa) but not 100% on that. After a little digging it turns out that the word katawa is rather old and there are references to its use as far back as the 12th century in a documant called the konjaku monogatari shu (tales of modernity and antiquity). It appears to have been more of a general term for something being not quite right, flawed in some way or incomplete as opposed to the narrow meaning of a physically disabled person it is used for today. The time it transitioned to the modern meaning is not clear but my instincts tell me that if it was a negative term from the start then it probably did have that meaning in Funakoshi's day. As far as translation goes (something I know a little bit about as I do it for a living!) there are a lot of different considerations and approaches used and complete slavish accuracy to the source text is not always a translator's highest priority or in their best interests. Clearly the information has to be correct but for a published work that is essentialy a commercial product the tone and accessibilty to the reader is paramount. It is also very true that what a reader with in depth knowledge of a subject and familiarity with the original language work finds important and wants to see is not neccisarily what a more casual reader or one with no grasp of the linguistic transfer process wants. I agree completely that the translation "The eight phrases for the secret of the fist" for ken no taiyo hakku is inaccurate and frankly quite sensationalising but in this case the translator must have thought that it would be more enticing for a prospective reader or something along those lines. I personally would translate it as "8 articles on boxing in general". In terms of making up facts for the whole marketing thing, I think most of the times the publishers are the ones who try to fit the product to the masses. In regards to Karate this is often counterproductive, because that feeds the Karate-Myth-Monster. I think that is why many authors try to publish their material on their own, so that nobody can adjust the material and changes things, the author sometimes sees first, when his material is published already and it is to late to intervine. Some material is rejected and never published because it is to controversal for the masses. I personaly am interested in the pure translation with a whole lot of footnotes and remarks and additional information, so I can digest the information according to my knowledge. Sure thing that is nothing for the masses. Back to the topic. I am really looking forward to Iains short films on the throws and their occurence in kata. Kubiwa is the second throw. There you can see, that kubiwa is not a neck crank, as Iain has stated before. Just a quick note to say thanks for the posts on the translations. I found that fascinating and I’m sure all other readers will too. I thank you both for your very valuable contributions and for freely sharing your knowledge. Thank you! Gavin, perhaps you could elucidate: kubi being the 'neck' part in my limited yunderstanding, what would be the Japanese word or phrase for "crank" / "sharp twist" in the context originally illustrated? Been looking at the Kata to understand where specifically where it is. As usual youtube is a good place to start ... so interestingly enough I started looking at Luca Valdesi and I couldn't see the movement ... then tried good old Kanazawa http://www.youtube.com/watch?v=Zftf4orGIn0 and at exactly 1.26 you can see the movement that for some reason Valdesi doesnt do. Interesting how the movement is completely gone from Luca's version?! Anyway I've snipped 6 stills from the Kanazawa and lined them up below. Here is the video I filmed when teaching at the weekend. I’ve also put the text that explains it below. Kubi-Wa (Neck Ring) is one of the nine throws Gichin Funakoshi presents in his book Karate-Do Kyohan. 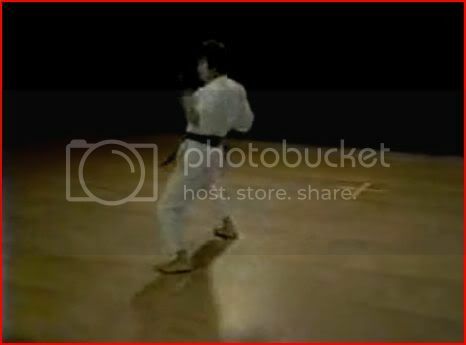 Funakoshi shows the throw following a block and palm-heel to the chin with the same hand that then encircles the neck. He also states that the palm-heel to the chin is optional and one could flow straight into the throw. In this clip I use a forearm slam across the chest to set up the throw; which is how the throw appears in Kushanku / Kanku-Dai. 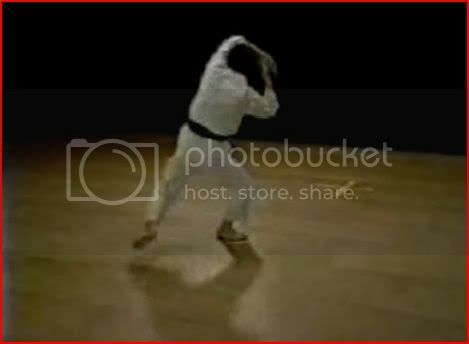 The sequence we are looking at is the final “nuki-te” in the kata, the bending of the arm, and the movement of the back leg around into the following horse stance. The arm across the chest pushes the enemy’s arm out of the way. We then project forward and slam the arm across the enemy’s chest (the spear hand). This is not a strike with the tips of the fingers, but a strike with the inside of the arm. It’s important that the arm is not swung in on an arc, and that line of the kata is followed. This will help break the enemy’s balance. The neck is then encircled – which is why the throw is called “neck ring” – and the enemy taken to the floor. I find moving the back leg, as per the kata, adds to the power of the throw; but it is possible to do the throw without it (which is how Funakoshi shows it). I also like to push on the face as the enemy falls in order to add to the throw, locate the enemy’s head as they fall, and to help reduce the chances of the arm being seized as the enemy falls. This is therefore my personal take on the Kubi-Wa throw and I hope you find it useful in your own personal exploration of the throw.